Stylish Wholesale Womens Clothing Manufacturer Based in Sunny Los Angeles California. 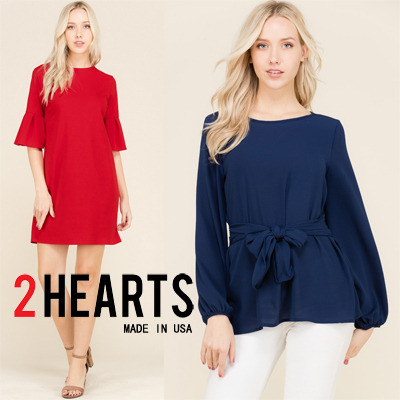 2 Hearts is a women's contemporary fashion wholesale company based in the heart of Los Angeles Fashion District with all styles being Made in USA. Our aesthetic is derived from producing pieces that complement the confident, fashion-forward women. 2 Hearts delivers timeless and versatile closet staples for women of all ages.